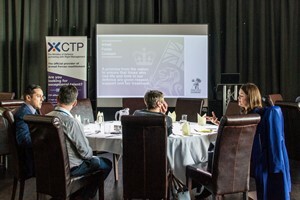 An event which promoted the benefits of employing current and former Armed Forces personnel was well-received by delegates. Around 30 delegates attended the event in Harwich, put on by Tendring District Council (TDC) as part of its commitment to the Armed Forces Covenant. Presentations were given by Kristina Carrington from the East Anglia Reserve Forces and Cadet Association, who spoke about the Employer Recognition Scheme, the Covenant and supporting the community, and James Moore from the Career Transition Partnership who talked about how organisations can promote their vacancies to service leavers. The event also included a networking opportunity for local businesses, with a range of industries from construction to legal firms and public sector all represented. Lieutenant Colonel Steven Caldwell, Colchester Garrison Commander, also attended. Chris Amos, TDC’s Armed Forces Champion, said he was pleased at how well the event went. “I am glad that so many people took the time to attend and learn more about the benefits of hiring Reservists and former soldiers, sailors and airmen,” Cllr Amos said.